To Clearly See, To Clearly Know. All Things become Visible. How to De-Calcify the Pineal Gland! One of: Supremacy over Nature, and over the limits of Nature (as “imposed” upon us in our current existence). A few self-professed masters of science, truth, and higher learning have continued the flawed thinking that: “Nature is imperfect, and it is up to US to refine and improve upon where ‘Nature left off’.” A general paraphrasing and summation of the thoughts and ideas of the privileged few in high academia and industry (interestingly enough), that shows a supreme arrogance and virtual narcissisitic attitude towards Nature, and the present condition of mankind. Through their lenses, the world is all screwed up because of ‘Nature’s Faults’. Never once, is it ever entertained within their high-society circles, that Nature IS quite perfect, and has been functional for over four billion years! The Human species has been one of the most successful in “Being Fruitful and Multiplying”, even in spite of the many harsh conditions around the world (like the driest deserts to the coldest artic reaches), and what mankind has placed upon himself (through imperial wars, conquests, “purges”, etc.). No matter what the circumstance, Man, as a creature and child of Nature, has always managed to bounce back and reclaim his territory and whatever cultures and customs that have survived. All of this, without resorting to “going virtual”, nor “uploading himself, his memories, etc.” to some centralized and hazard-prone mainframe. Man has shown a remarkable resilience, even against himself – in spite of himself, without transforming into something other than a natural creature and inhabitant of this world. The history of man’s successes and failures is a testament to what mankind has been able to accomplish, for good or for ill, by his own innate, natural abilities. WHERE is the imperfection in all that? Perhaps, adopting an old maxim: “Spiritual Beings, having a Human Experience” makes most sense here. However, most of the Trans-Humanism Movement are, by and large, atheistic. A-HA! Maybe there is something to this whole process, all based on this very narrow-minded thinking. That is, the very narrow-minded thinking that they claim that those of us who believe in a “god”, or believe in any kind spiritual afterlife has a “mental disorder”, or are delusional. Perhaps, this is a “run-off” from the distaste of any form of religion, courtesy of the flawed concepts and teachings of the modern-day “church”??? It seems to me that the greatest contributor to the growing ranks of “atheism”, are most of the modern “churches” and their pernicious and often predatory practices and dogmas. To have a religion is not the threat. To define one’s own life by reference to one or more religions is similar, no threat. The problem lies in the excuses to do ill towards others of differing beliefs, by falling back onto their own religions is the key problem. However, that is not a fault of Nature. The blame lies squarely with those who exert control over their congregations, and the individual participants in the congregations themselves. One CAN be spiritual, without being associated with any of the known, established religions. I suppose that a “virtual existence” would be posited as the answer to this age-old problem? After all, machines have no need for a religion, right? Therefore, such an extensive virtual reality would also have no need (and no place) for any religion or spiritual expression? Now what would this reduce man to: A mere collection of bits, bytes, and patterns of digital data that need a means to travel from location to location? Then, we have the question of what parts of the “Human Reality” could be successfully and faithfully reproduced? We often take for granted, the various stimuli and interactions we have with the world around us. One of those, is the ability of sight. If one has never experienced blindness, or any severe impairment of vision, how does one come to appreciate the things he/she sees (or should see) every day? We may wonder what a blind person “sees” or what one could perceive of the world around him/her when clearly, eyesight is not a luxury, nor ability, available to him/her. Obviously, someone like Helen Keller still had the ability to “see” the beauty of the world around her. Whether it from some hidden sense of “sight”, or some other form of knowing, she still became a very wise and appreciative lady, in spite of her lifelong “disability”. The creative abilities of the mind can never truly be underestimated. We oftentimes do not consider how important our sense of hearing is to us. One who is deaf, or even has severe enough hearing difficulty, may still be able to experience some aspect of life is if he/she still had some ability to “hear”. We all have our favorite songs and music, and even our particular haunts and hangouts where the “ambience” or “atmosphere” includes certain particular sounds and qualities of sounds we may find most appealing. Many of our choice melodies and tunes even invoke memories of things we experienced when we last heard those particular songs. Some of the sounds in our environment may evoke certain emotions and feelings. Can we truly say we have a healthy appreciation for these things, by taking the fact of our ability to hear them, for granted? Would our not ever being able to hear things around us impact what and how think about our world? We also have our ability to taste that which we consume, and savor every bite – if we so choose to. Many of our world’s finest old-time cooking, and the various cultures that produced those varieties of flavors, have much meaning, on a personal level, to us. I have always found that the wonderful smells of good cooking, had me anticipating the flavors I was about to experience at the table. These wonderful experiences in the culinary art, and in the presentation of these fines, homemade dishes was also what made life worth living for. I have known a few friends who had lost their senses of taste (and sometimes, sense of smell too) due to accident(s) and/or the resulting permanent injury(ies). For one to lose his sense of taste, after growing up most of his life being to savor all kinds and qualities of flavors, all to suddenly lose that ability, must indeed feel that his life has changed dramatically. When we were children, “taste” was one of the sensory means of exploring our world. Being able to touch and feel textures, reliefs, and various surfaces (and other stimuli, even the incidental [like bug-bites, etc.]) is a very important part of our interactions with the world. Our existence relies very heavily, and is often greatly enriched, by our tactile sensitivity, and the ability to recognize and appreciate this physical sense. We also commonly communicate through touching, hand-shaking, “atta-boy” pats on the back, and even the caressing and “petting” of our dearest loved one(s). The sense of touch is a very personal and inter-personal sensation to us. We may even feel the desire to “feel” the rough bark on a tree, the gravel or sand beneath our feet when we walk, or even enjoy the gentle currents of water in a nearby creek or stream. Our tactile exploration of life in our world does not seem to end, until the day we leave this world. We constantly explore for new sensations, and reunite with the old familiar ones. What would life be like, without being able to actually feel and touch things and other people around us? Would we still be having the fullest of that “Human Experience”? One thing I enjoy most of all about the season of Spring: The wonderful smells of sweetness of the first flowers! It is one of the biggest reasons why I love the Spring. The smell of the Earth awakening from its long, Wintery slumber, is a reminder of changes, and how Nature constantly reinvents herself, every year. The enjoyment of the olfactory experiences is also one of the reason I love being in a forest of Pines, Spruces, and various other odiferous and aromatic trees and herbs. I love the smell of Pine and Cedar! As such, the world filled with all sorts of smells, is often the first indication for the new day. Here where I live, it is semi-arid conditions, and has plentiful Sagebrush on the plains. Every Fall, when it is late enough for some frost, after a good nighttime rainfall, I can usually smell the fresh scent of Sagebrush in the cool air in the mornings. This always reminded me of that particular time of year (and that I was back in school for another long nine months). To this day, I have long since moved back to this area, and still enjoy the smells of Spring, and Sagebrush smell of the Fall – especially after a night of cooling rains has soaked the ground. What would such a life be like, not ever having to experience the various smells around me, or having the ability gone – after experiencing for a number of years already? Then, there is the aspect of Extra-Sensory-Perception (for those who acknowledge and/or believe such is possible) or E.S.P. This is a natural ability that ALL living creatures (even plants and microbes) seem to demonstrate. It is amazing what some creatures do as a reaction to some unseen activity, or in response to some otherwise-unknown event or happening. Some of your modern-day psychics (the REAL ones, not all those charlatans who claim to be psychic) and empaths exhibit and/or acknowledge these abilities. Some would say that being devoid of E.S.P. abilities leaves one lacking in experiencing the world hidden from “plain view”. Though today’s “science” refuses to even entertain any discussion, let alone true meaningful, un-biased research into it, there are still many unanswered questions about E.S.P. Interesting that Quantum Physics, Entanglement Theory, and the various related disciplines of science, have been summarily ignored by the “mains” of academia. Even though the Quantum Sciences have been around and discussed and explored for many years, there is hardly any main-stream discussion about them today. Yet, the Quantum Sciences appear to more strongly support the idea of the old adage: “Mind over Matter”, where our very thoughts can also influence surrounding events, as well as be highly receptive to them, even as very subtle events. Would such ever really be possible in a “virtual reality”? Our basic “senses” of the physical (and perhaps, “aphysical”) nature are very important to us. Not only are there survival needs for them, but also these senses are how we best interact with the world around us. When we are impaired in one or more of the senses, especially when we experienced part of life through them beforehand, we can, for a time, feel as though we “lost” a connection to this existence, and perhaps even lost an ability to further explore our world. Our sense are a very important part of our personal development, and even as part of our spiritual practices (for those who do have spiritual practices, anyway). We highly value our five (or “six”) senses, view them as divine gifts (or at least – important abilities) in which are able to experience our world, and perceive our world. These senses are an extension of our inner Being, and are how we relate to the outside world. Without them, our lives would probably be very different than from what we currently perceive. We base our views, perceptions, and values on the various experiences we have, especially as relating to what have experienced through the senses. Take these away, and you will most likely take away the most important parts of what it means to have a “Human Experience”, and what it means to be alive! It makes no sense that the created, can ever surmount and defeat its creator! The ostentatious idea that a few “educated” folks (who often call themselves “scientists” and “experts”) calling themselves superior to Nature, is a very dangerous and fatalist position. It is when folks like them, have the temerity to call themselves as better than anything natural or nature, on the mere premise that “science” has ALL THE ANSWERS, and that our “primitive” ancestors new virtually nothing in comparison, who apparently live a life of extreme hubris. It is also telling how science has been simply turned into a tool for exerting more political power, and as a means to put to rest any competing thoughts, ideas, beliefs, and theories, all under the guise of “expert opinion”. Expert Opinion does NOT, I repeat does NOT create scientific laws nor supercede already-existing natural laws! Mere opinion, regardless of the credentials behind it, is STILL subject opinion without the basis or weight of evidence or fact. Yet, this is what is being used to rule over all of us. The nest step in the amalgamation of all that political power, namely – the ability to control every aspect of our state of being – TRANS-HUMANISM, and the intense effort to build in systems and architectures, in which to reduce and store the sum quantity of mankind, and man’s totality to mere bits and bytes of compuetrized, digitized data. Simply digitizing, that is – converting from the natural form and expression – into a series of one’s and zero’s that make up the digital data stream, something as basic as a picture, represents a conversion process that introduces losses of quality and resolution, through the introduction of errors, that vastly separates the digital “copy” from the original. The digital copy becomes flawed, especially over several generational copies, to the point that it simply CAN NOT faithfully and accurately reproduce an excat copy of the original. This is the nature and the limits of the technology. Life, Experiences, and all other aspects that are a part of what we call “Life” (or even existence) can NOT be simply “copied” through artificial means. These aspects can barely even be remotely copied through the prevailing natural means, let alone through arrtifical, technological means. So HOW does one reproduce the original human being, complete with an exact copy of his experiences, likes, dislikes, memories, etc. if we STILL can not accurately (and exactly) reproduce a mere picture of the real thing, from a digital copy? Modern medicine, with all of its nuanced and ever-evolving “drugs” (allopathy) and how many annual deaths result in these united states of America – all from taking, by instruction, prescribed “medications”. Mankind has been served well, for many thousands of years, by what could be found in nature. Even many of the ancient religious and spiritual texts described the many benefits and “miracles” of the various plants and animals that man can use. For many thousands of years, Naturopathy and Herbalism has maintained entire populations and cultures. Yet, there is no “profit motive” to actually curing and healing the people of various diseases and illnesses, with today’s “modern medicine”. Modern forest and land management practices – How we used to extinguish EVERY naturally-caused fire that were once cyclical and normal – to the point that now the forests have much over-growth to the point of creating a huge, dangerous tinderbox. Resulting in hotter-burning fires (often in excess of 2,500 degrees Fahrenheit) and far more devastation. We also have many invasive weeds, of exotic origin, that were once used to replant burned out grassland areas. Most of these exotic weeds are very aggressive, very hardy, and quite toxic to most of the native wildlife – AND – often contribute to even more-hazardous fire conditions! Modern Wildlife management practices – Where we now have a serious problem of (re)determining the proper population balance of predator-to-prey animals, include for man’s needs (hunting, food, etc.) – as well as through the questionable introduction of exotic species into the natural ecosystem – without determining first, what other effects this introduction may have there. Weather Manipulation/Modification Projects – This is by no means absolutely incredible and incredibly dangerous! There is absolutely no reason to ever tamper with the weather and/or climatic patterns, especially by aerially-depositing noxious substances which will eventually end up in the soils, waters, and breathable air shared by ALL living things within a given region/area/etc. This is just absolute pseudo-science hubris at work! Our Food and Modern Nutrition – Has been under attack and subvert for the sake of profit for many years now. The “Genetic Engineers” seek this path of “improvement” of our many crops for food, foodstuffs, clothing, and basic essentials. Yet, Nature had everything we needed – to include healthy soils. This proliferation of GMOs (Genetically-Modified-Organisms) represents a severe threat to the natural selection of native species, and therefore – the very survival of many species of other plant and animal life on this planet. The degradation and destruction of many colonies of Honeybees is a significant threat to the survival and well-being of ALL of us, all from these GMOs and the various chemical poisons used on and around them. Not to also mention, that these GMOs are all “Intellectual Property” under the current laws! HOW DOES ONE DECLARE “OWNERSHIP” OF AN ENTIRE SPECIES??? It comes as no surprise that control, greed, hubris, and various other self-destructive, self-centered mindsets are what bring about this egotistical thinking that a few “smart men” can “change the world for the better” by claiming that they, and their knowledge, are superior to that which created and maintain this existence – and all the beings within it – for perhaps, billions of years. What’s more, every instance that establishment “science” has been used to further incur into Nature and Nature’s God’s realm and powers, are each and every instance that disaster very soon followed. So WHY should I trust anything coming from their lips, and the salemanship of the Trans-Humanism Movement when they say: “This will be the evolution man” – when in reality, I see it more as a destruction of humanity, and destruction of all what it means to be human??? If we can not even simulate, let alone reproduce the ability of our senses, both physical and aphysical, to act and respond in the very same way that our bodies and souls do so, naturally, then HOW can we support pushing man into the merger with machine, or even towards this “singularity” that was never meant to be? When a few men decide the course of human evolution, or for that fact – taking over ANY act of evolution for anyone, including other animal and plant life, is the day that all Nature, and everything within it, are in serious jeopardy – and these few “scientists” and their enablers need to be shunned and fully divested from any source of public trust, profit, and away from any ability at political influence! This is a must do! If we are to continue onward, and evolve NATURALLY, as our gods intended, then it is time we throw off of this scientific tyranny for once and for all. These so-called experts, are merely either paid “mouth-pieces”, or they really are in the position of setting the course of social policy, and in the effect – setting the course of evolution – to THEIR (ignorant) specifications. Let’s do this right. Throw off Trans-Humanism. Throw off GMO’s and all the attendent uses of all those poisons. Throw off the tyranny of weather control/manipulation and the resulting tight controls on our critically-needed Natural resources. The “Singularity” is NOT our friend! It has been a while since I last wrote anything along the lines of this mini-series. Perhaps it is time to visit this subject area some more? Here it is, about a year or so since my last posting to this series, and the crescendo and “chorus calls” for further merging “man with machine” grows ever louder still. It is almost as if a cult following is brewing around the technocratic world to push the limits of reality (our rather limited view of, anyway) into the “outer limits” of human experience. Is it truly possible to completely digitize, and then reproduce from the digital recording, all of a being’s total experiences; feelings; perceptions; and the totality of “being Alive” into a true, complete reproduction of the original being’s state of Life? As some of the more technically-savvy folks may know as common fact, digitizing the analog of video, audio, and even still portraits, results in a loss of clarity, resolution, and various other little bits of data and information that completely describe and “bring to life” the aspects of the original. When trying to convert the digitized copy back towards its original state, these losses can vary from the imperceptible (to the human senses, anyway) to the very great. There is still a “lossy” component to all of this conversion and duplication, when using any form of artificial means to accomplish this task. In essence, “perfection” is, itself, lost in the conversion process. The “copy” MAY resemble the original, but it is still far less a “perfect copy”. Another depth to approach this subject and the problem of “Nature-to-Machine” transference and ‘hybridization’ (there is no breeding aspect at play here), is that technology can, at best, simulate a reality, rather than create a reality the way Nature has done. When we make a digital conversion and/or copy, our copy becomes more the approximated “simulation” of the real original. To simulate, is to “pretend” it is as the “real McCoy”, and sometimes treat it is real, though it is only simulated. Any artificial machine, even be it the most powerful super-computing systems in the world, is vastly limited in its abilities to render a “reality” in anything close to how Nature creates and renders a reality! The human brain alone, is still one of the most complex computing machines without equal! The human brain computes at far greater depths and resolutions than any computer ever could. This is because the human brain, or any living brain for that matter, is not limited to a basic set of calculations, algorithms, “tables”, or any other simulated process of events and sequences. It is not limited to a specific, identifiable, “standardized” number set or instruction set. Therefore, the brain can truly reproduce certain experiences and images far closer to the quality of the original experiences and images that were first introduced to it. Sure, the “resolution” of the reproductions may suffer somewhat, all because we rely very much on a linear spoken and written language, and/or our ability to reproduce such on a canvas. Nonetheless, those things experienced within the mind, and housed in the brain, are experiences that become a part of our lives. This is as Nature intended, for mankind, animalkind, and plantkind. It is thought that some protozoa and smaller life forms could also have a certain “memory” and experiences too. The merging of man to machine. How do we really reconcile the differences between that which is natural, with that which is artificial? When we talk about artificial or “manufactured” (presumably from an automated assembly line process) as opposed to “natural”, what often gets very little discussion in those kinds of exchanges; The element of “sameness”, as opposed to “uniqueness”. When something is mass-manufactured, virtually every product from that process is going to be very much the same (except for the occasional inconsistency, and the ever-so-slight imperfections in material, etc.). Still, the sameness of the end product is unmistakeable. Nature, on the other hand, creates “similarities”, but each and every individual still has a certain amount of recognizable “uniqueness”, especially evident in certain physical and habitual traits. Not every dog will behave the same way, to the same stimulus, in the same environment, at the very same time. Each and every dog has a certain individuality, based on its own life’s experiences, the environment it was reared in, and the associations with others (who themselves, were individuals). This is often reflected in certain behavioral traits and mannerisms, even to the slightest degree. Not every horse will behave exactly as the next horse, and so on, and so on, and so on. Each and every horse, is a unique individual. The same could be said of every single species we have been able to identify, and ascertain its general, similar behavioral habits, and be able to observe occasional variations by individuals. Nature, is about uniqueness, and also perfects the ability of these unique individuals to still play an active part of the “Natural Tapestry of Life and Existence” and thrive. Has any one of these scientists, innovators, technicians, technologists, etc. ever thought to ask such a thought-provoking question as this one? Has anyone ever seriously thought that there is certainly MORE to being Human, and even being Alive, than just the mere physical presence? Some “scientists” think that our physical presence, and its attendant collection of chemicals – reacting in such patterns – are what define us in the totality. At least, the Stephen Hawkings’ of the world believe so. What about how it is that we each of us have individual experiences, that are very often quite different from those of others around us? What about the fact that even identical twins (or identical “siblings”), even when reared in the same home, fed the same foods, and treated the very same fashion, can STILL express a certain amount of individual uniqueness – in spite of the “sameness” of the childhood upbringing?!?!? – The Hawkings’, Freuds’, and others of like mindset, simply can not honestly ponder an honest answer to that question, without defaulting to the establishment-acceptable type of answer that it is “all chemical”, and that our feelings, emotional states, memories, and even particular likes and dislikes are all governed by chemistry. So this is what many in the “Trans-Humanism” crowd think is what makes us all “biologically suitable” for the great “singularity” of man-and-machine. Nature, on the other hand, does not think so! The method by which duplication is accomplished, and to what effect or result. Technological means of duplication (or “reproduction”) must rely on creating (near) exact copies of the original. These copies must, necessarily, be “translatable” to the form recognizable by the technology in order for it to work with the data in question. This means that the original “data” needs to be “simulated” by being “digitized”, and resulting in a loss of quality and resolution, in order for a “copy” to made from it. So, we are simply making “lossy” copies of a “lossy” copy of the original. Usually, a duplication is expected to be AS GOOD AS or perhaps (in the Natural way) something of an improvement from the original (like something akin to an evolutionary change, by expression of the more-suitable genetic traits for enhanced survival of the individual). A technological answer to the degradation of quality of the copies is usually by “approximating” the missing values by some means of calculations and “assumptions” on what needs to “fill in the blanks”! These missing pieces may be entirely different values, than from what is “assumed” to be suitable to fill in this blank spaces. These assumed values may even introduce more “errors” into the copies. Now, what often happens when copies of copies of copies, for several “generations”, keep accumulating more of these “statistical errors” with each and every duplication? Eventually, you have a completely unworkable, unusable, and perhaps even unidentifiable copy that looks very little like the original. What means and ways are there to actually correct and compensate for the accumulation of these calculated statistical errors, from several generation-copies, especially when the stable original is no longer available? Nature’s answer was in the Mitochondrial DNA (some think of as the “genetic library or – parts-box -” for use in repairing damaged DNA). Nature has so many layers of redundancies and “checks-and-balances” built right into the bodies, down to the cellular level, to maximize the survivability of the individual and his/her species. The technological “solution” has still YET to maximize its abilities to redundantly protect, from losses, its data from failing, and eventually – being totally lost. Some would say that “Life” is fragile, but the technological “solution” is easily far more fragile and corruptible in the nature of its very existence, and how it implements its “solutions”. Even one slight miscalculation or inaccurate assumption of a value, can greatly increase the risk of errors, or even eventual total loss, let alone usability of the data and/or product. Creation is purely a mental activity that requires actual thinking, to which machines’ abilities at thinking still lag far behind the ability of a living brain’s. To that, I answer “No”, and I will explain why. A machine is severely restricted in its ability to “think”. What is considered “thinking”, in a machine’s terms, is in reality, a series of calculations based on a set of instructions that the machine is given. The instructions are coded according to a set of “programming rules”, as dictated in the specifications of the programming language that was used to code those instructions. There is very little room for “randomness” and incidentals, because machines (computers, in the specific) expect and REQUIRE a specific structure and organization of instructions and data, and a specific sequence in which to execute those instructions upon that data. The first “law” of programming I learned many years ago: “G.I.G.O.”, which stood for: “Garbage In, Garbage Out.” In other words, if a specific “program” (a set of instructions to perform a specific task or set of tasks) is improperly “coded”, and/or its containing instructions are out of proper sequence, your program may yield incorrect/inaccurate results, or not function at all. A computer knows very little about “fudging” results and or remediating an issue without the proper set of instructions to handle those “unusual” situations or conditions. Thus, a computer, as an artificial “brain”, becomes useless for performing the task as desired, until the program code is reworked, and its instructions coded to execute in a proper sequence. The “sequence” of instructions is also called its “program flow”, or “execution flow”. One diagrams this on a “flow chart”. To a computer, each and every instruction must be exact and accurate, down to the smallest step, in what is to happen next. Therefore, computers (and other machines) are very literal and exact. A machine can not make a “guess” without being told EXACTLY how to guess and when to guess and what to guess. It is all based on multiple steps of mathematical calculations and “decision-making” (that is, in “if’s”, “and’s”, “or’s”, “then’s”, “when’s”, “else’s”, etc. . .) tests of various results, etc. The limits of the types of results, to tests for in these “decision-loops” must be built into the program’s code. They are static until they are changed by the programmer, and then recompiled and deployed to the computer. There are definite limits inherent to nature of computing. Because of these limits by construction, a computer’s ability to “think” is very limited, very literal, and very precise in its effects and doings. It simply can NOT “think on its own”. It needs to be “told” how to think, what to think, when (if applicable) to think, and to what depth it needs to “think” the expectable solution to be. Creativity requires a lot of thinking and the resultant “decision-making” throughout the entire creative process, even though much of this thinking and decision-making is not so obvious to the creator. If we are talking about rendering the essence of a human being’s life into digital form, we stand a great chance of losing some of the most important characteristics of what it is to be “human”, to include the genuine ability to create. This is the nature of “digitizing” a copy of anything from an actual existing thing: We WILL LOSE quality and resolution along the conversion process; enough to lose some of the most important aspects of the individuality of that actual thing. Is THIS really such an “improvement” over Nature, especially when we chance to lose some detail that was originally there in the natural form? So, at best, a machine – even as advanced in technology as a computer – is only capable of simulating and/or rendering a simulated copy of the real thing, but not actually creating from itself. The Pentagon’s advanced research wing has announced its latest budget — and whoa, does DARPA ever have some ambitious plans for the future. Their new Biotech unit will be harnessing biology for national security, and dealing with everything from stopping plagues to building synthetic soldiers. 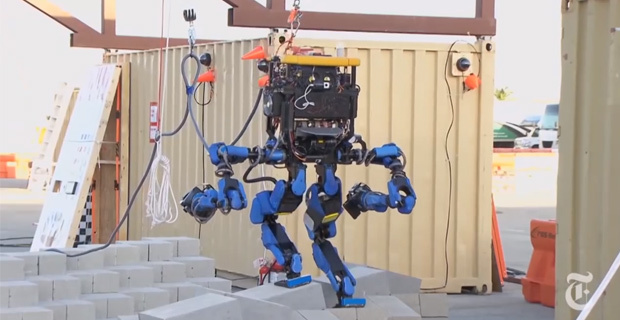 DARPA’s commitment to cutting-edge innovation is unquestioned. The very essence of the defense agency is to make sure that U.S. military technology is more sophisticated than that of the nation’s rivals. Among its many current initiatives, DARPA is working on advanced robotics, an artificial human brain, next-gen robotic aircraft, advanced prosthetics, and self-teaching computers (if anyone’s going to build a recursively improving AI it’s going to be DARPA). In addition to these projects, DARPA has been busy at work on various biotechnology-related endeavors, but these attempts to date have lacked cohesion and focus. Looking to change this, DARPA has announced the creation of its Biological Technologies Office (BTO)— an effort to “explore the the increasingly dynamic intersection of biology and the physical sciences.” The new division will expand upon its Defense Sciences (DSO) and Microsystems Technology (MTO) Offices. Are some salient points being made when talking about the trans-humanist movement and what are its collective(?) ideologies and beliefs. This is not about taking a disparaging view of others’ beliefs, but a serious cross-examination of what “beliefs” are being instilled, through peer-pressure, salesmanship, and “product-placement” (more on this term later) through the media and entertainment industry. The new paradigm rejects a crucial assumption that is implicit in both traditional futurology and practically all of today’s political thinking. This is the assumption that the “human condition” is at root a constant. Present-day processes can be fine-tuned; wealth can be increased and redistributed; tools can be developed and refined; culture can change, sometimes drastically; but human nature itself is not up for grabs. Superintelligent machines. Superintelligence means any form of artificial intelligence, maybe based on “self-taught” neural networks, that is capable of outclassing the best human brains in practically every discipline, including scientific creativity, practical wisdom, and social skills. This little section gives me reason to pause my thoughts for a moment. “Superintelligence”, by artificial means, is quite capable of doing massive calculations and “simulations” far greater than man’s own brain can CONSCIOUSLY express. We never think about the “sub-conscious” part of the brain (where it is said that our connection to anything spiritual would be closest). However, even the fastest of super-computers are STILL unable to truly “create” in the way that man’s mind does so, naturally. The idea that a machine could outdo man in such creative and aesthetic things as art, music, “practical wisdom”, “social skills” to the level that man does naturally, is but pure fantasy. Perhaps, as more time goes by, we may see some machines get closer to the mere “simulation” of a creative act. However, it would still be a “simulated” act, limited to the logical operations of an artificial machine by the basis of its programming. The Creative abilities of human beings are a natural-born trait. We are ALL able to access that creative bent, to whatever potential we may realize, and use it to create (and/or destroy) purely on the basis that it is a Native Talent to actual living things. No artificial intelligence, nor any advanced computing system is going to be able to stretch its own limits and boundaries – as it will still bump into its own limits of memory, program-adaptability, and the confines of the architecture itself. More so, if any such device or system was to be actually be deployed, how much “self-control” would such an entity be capable of, considering that human beings are, as individuals, are usually rather limited in the amount of damage and destruction he/she could do – before the corresponding risks to him/herself become great enough to actually “self-limit” the situation and the individual. Lifelong emotional well-being through re-calibration of the pleasure-centers. Even today, mild variants of sustainable euphoria are possible for a minority of people who respond especially well to clinical mood-brighteners (“antidepressants”). Pharmaceuticals currently under development promise to give an increasing number of “normal” people the choice of drastically reducing the incidence of negative emotions in their lives. This passage almost looks like it was inspired by “Brave New World”, by Aldus Huxley. The basic theme is, “a pill for everything“. Today’s “modern medicine” is also about, “a pill for everything“, even when better, safer, natural remedies exist to deal with the specific health problems. The “big pharma” and “medical” industries have profited handsomely on the sales of drugs and other questionable medical therapies, while at the same time, decried and even forcibly silenced any talk, independent research into, and successful evaluations of natural therapies. Long gone is the modus, “Let Thy Food be Thy Medicine, and Thy Medicine be Thy Food.” as was well-said by Hippocrates, the Father of Modern Medicine. A “pill”, or a novel “drug” will fix that right up! Personality pills. Drugs and gene therapy will yield far more than shallow one-dimensional pleasure. They can also modify personality. They can help overcome shyness, eliminate jealousy (Kramer ), increase creativity and enhance the capacity for empathy and emotional depth. Think of all the preaching, fasting and self-discipline that people have subjected themselves to throughout the ages in attempts to ennoble their character. Shortly it may become possible to achieve the same goals much more thoroughly by swallowing a daily cocktail pill. The reliance on a “pill” to fix something perceived to be wrong, this time – the “personality”. Everyone has a unique personality. That is how we express ourselves, and it is also how we learn about and learn to relate to others. Our very Humanity depends on our having a personality that is none like any one else’s. The perfection of an “ecosystem” (for lack of a more-suitable term), is in how well the unique and different parts and members of it – successfully interact and coexist. Where one may have a personality “fault” or weakness (if that could be justifiably stated without being too subjective), one has the ability to recognize it, if it is truly a “fault”, or an asset that “has its best fit” in a specific environment or social circle. Not all of us have the outgoing “flash” to make us able to act on stage, play music, or any such occupation or hobby that does best for the outgoing types. We are all unique and special in our own way! This is what makes for a strong community, based on the unique traits and talents of the various personalities within. A truly free society benefits best when the unique talents of each member are given equal chance to contribute to his/her community (while remaining confident and knowing of his/her own “Humanness”). One should NOT need a pill or any other drug to induce a change in personality, for the sake of doing so, let alone for the sake of others. There is a place for all personality types as they are all important to the fabric of their community. “Personality Pills” can very easily become a very dangerous weapon in a tyrannical society. We think we have problems today with censorship and even forceful crackdowns on peaceful protests and demonstrations, all due to their opinions not being the “politically-popular” choices, the appearance and use of “personality pills” should send chills down everyone’s spines! This is NOT the kind of future I look forward to! Space colonization. Today, space colonization is technologically feasible but prohibitively expensive. As costs decrease, it will become economically and politically possible to begin to colonize space. The thing to note is that once a single self-sustaining colony has been established, capable of sending out its own colonization probes, then an exponentially self-replicating process has been set in motion that is capable – without any further input from the planet Earth – of spreading out across the millions of stars in our galaxy and then to millions of other galaxies as well. Of course, this sequence of events will take an extremely long time on a human time-scale. But is interesting to notice how near we are to being able to initiate a chain of events that will have such momentous consequences as filling the observable universe with our descendants. And the sheer-long lists of abuses of that power, I sincerely hope the rest of the intelligences in the Universe take serious note. This “colonization” nearly ALWAYS has dire consequences for those who were pre-existent in the areas to be colonized. Such activities have usually ended up removing and/or annihilating the pre-existent race, species, Kind from those areas. Enough of man’s history for the last several thousand years years is testimony to this fact. Tyrants of empires and kingdoms always seek to expand their spheres of influence, no matter the horrible costs to the conquered. We, collectively, have done very little good in taking good care of our present home, planet Earth. So WHY should we expand our spheres of influence, across the galaxy and universe, to end up doing the same thing elsewhere??? At what point, may a more advanced species in a far off world, begin to seriously consider us a contagious plague, especially when it is some of their colonies that lie in peril to our expansion? If modern human history is of any account, the same kinds of tyrannical political systems of control would exert their influences in those times to come, because we have not yet taken the battle to those political systems to halt their predations now. We have much growing up to do, BEFORE we can expect a universally-expansionist culture to fare better with our likely neighbors in the future. We still have our work cut out for us; as in unfinished work in regaining the right to exist as Natural Humans should. Next: Part 4 – I will cover the drive to “Re-define Evolution”, and the trans-humanists’ desire to redefine humanity in their view of technological supremacy over Nature. The reference to cosmic rights occurs late in this, the final chapter of F.M. Esfandiary’s _Optimism One_ (1970). I thought I’d reproduce the whole thing. even to the most radical ideologies. far more basic status quos. _too_ radical an event for the psyche and the intellect to cope with. when one day soon they wil be told that they can enjoy eternal life. total psychological and social reorientation. the most effective way of making a dent in the granitelike status quo. greater than death? Death itself is the end of freedom, the end of progress. too full of promise and potential to squander for _any_ cause. some logic; today it is a sure sign of stupidity. this planet for thousands of years. anything more radical than this determination? friend, but it is no longer revolutionary. A totally new set of premises and goals are now emerging. want to do away with the very dependence on food. unconfined to any bodies at all. transmit knowledge and information to every individual anywhere on the planet. short of the complete elimination of money and labor. energies of more giant suns. technology as a great evolutionary step, but want to go _beyond_ technology. post-technological age of extrasensory perception and communication. enough. We now want cosmic rights. We want the freedom to roam the universe. belongs to the Third World, _all_ mankind is proletarian. It is apparent in what is to be stated and what is to be believed within the trans-humanism movement. The blame is placed, by them through manifestos like this one, on “living by the old standards” (IE: “by the Natural course”). It is apparently their collective belief that “technology” is here to save mankind “from itself”. Judging by the language that is common in many discussions concerning trans-humanism, there seems to be a growing “superiority complex” among its adherents. Such things become even more noticeable with terms like “H+”, “>H”, and “~>H” which stand for transhuman and/or “above (or beyond) human” . The gist is that transhumanists consider themselves having the right to be beyond the limits of the Natural Law (sometimes referred to as “Cosmic Rights”, in their parlance). If what many of the loose collection of documents from the trans-humanist movement(s), which may be referred to as informal “manifestos”, say on the subject and the current state of world affairs they claim to be ready to improve upon, the rest of us ‘out-moded’ Natural-borns may be headed for some serious consequences down the road! Next: Part 3 – A detailed point-by-point examination on the ludicrousness of the trans-humanist movement’s(s’) aims and goals. There is a lot of discussion and “selling” of an idea that I strongly believe is not being thoroughly examined and cross-examined. I have even seen the term “digital shaman” being used to describe those who are at the forefront of the movement. Lifelong emotional well-being through re-calibration of the pleasure-centers. Even today, mild variants of sustainable euphoria are possible for a minority of people who respond especially well to clinical mood-brighteners (“antidepressants”). Pharmaceuticals currently under development promise to give an increasing number of “normal” people the choice of drastically reducing the incidence of negative emotions in their lives. In some cases, the adverse side-effects of the new agents are negligible. Whereas street drugs typically wreak havoc on the brain’s neurochemistry, producing a brief emotional “high” followed by a crash, modern clinical drugs may target with high specificity a given neurotransmitter or receptor subtype, thereby avoiding any negative effect on the subject’s cognitive faculties – (s)he won’t feel “drugged” – and enables a constant, indefinitely sustainable mood-elevation without being addictive. David Pearce  advocates and predicts a post-Darwinian era in which all aversive experience will be replaced by gradients of pleasure beyond the bounds of normal human experience. As cleaner and safer mood-brighteners and gene-therapies become available, paradise-engineering may become a practicable possibility. Molecular nanotechnology. Nanotechnology is the hypothetical design and manufacture of machines to atomic-scale precision, including general-purpose “assemblers”, devices that can position atoms individually in order to build almost any chemically permitted matter-configuration for which we can give a detailed specification – including exact copies of themselves. An existence-proof of a limited form of nanotechnology is given by biology: the cell is a molecular self-replicator that can produce a broad range of proteins. But the part of design space that is accessible to present biological organisms is restricted by their evolutionary history, and is mostly confined to non-rigid carbon structures. Eric Drexler (, ) was the first person to analyze in detail the physical possibility of a practically universal molecular assembler. Once such a gadget exists, it would make possible dirt-cheap (but perfectly clean) production of almost any commodity, given a design-specification and the requisite input of energy and atoms. The bootstrap problem for nanotechnology – how to build this first assembler – is very hard to solve. Two approaches are currently pursued. One of them builds on what nature has achieved and seeks to use biochemistry to engineer new proteins that can serve as tools in further engineering efforts. The other attempts to build atomic structures from scratch, using proximal probes such as atomic-force microscopes to position atoms one-by-one on a surface. The two methods can potentially be used in conjunction. Much research is required before the physical possibility of Drexlerian nanotechnology can be turned into an actuality; it will certainly not happen in the next couple of years, but it might come about in the first few decades of the next century. Vastly extended life spans. It may prove feasible to use radical gene-therapy and other biological methods to block normal aging processes, and to stimulate rejuvenation and repair mechanisms indefinitely. It is also possible that nothing short of nanotechnology will do the trick. Meanwhile there are unproven and in some cases expensive hormone treatments that seem to have some effect on general vitality in elderly people, although as yet nothing has been shown to be more effective at life-extension than controlled caloric restriction. Extinction of intelligent life. The risks are as enormous as the potential benefits. In addition to dangers that are already recognized (though perhaps inadequately counteracted? ), such as a major military, terrorist or accidental disaster involving nuclear, chemical, viral or bacteriological agents, the new technologies threaten dangers of a different order altogether. Nanotechnology, for example, could pose a terrible threat to our existence if obtained by some terrorist group before adequate defense systems have been developed. It is not even certain that adequate defense is possible. Perhaps in a nanotechnological world offense has a decisive intrinsic advantage over defense. Nor is it farfetched to assume that there are other risks that we haven’t yet been able to imagine. The interconnected world. Even in its present form, the Internet has an immense impact on some people’s lives. And its ramifications are just beginning to unfold. This is one area where radical change is quite widely perceived, and where media discussion has been extensive. Uploading of our consciousness into a virtual reality. If we could scan the synaptic matrix of a human brain and simulate it on a computer then it would be possible for us to migrate from our biological embodiments to a purely digital substrate (given certain philosophical assumptions about the nature of consciousness and personal identity). By making sure we always had back-up copies, we might then enjoy effectively unlimited life-spans. By directing the activation flow in the simulated neural networks, we could engineer totally new types of experience. Uploading, in this sense, would probably require mature nanotechnology. But there are less extreme ways of fusing the human mind with computers. Work is being done today on developing neuro/chip interfaces. The technology is still in its early stages; but it might one day enable us to build neuroprostheses whereby we could “plug in” to cyberspace. Even less speculative are various schemes for immersive virtual reality – for instance using head-mounted displays – that communicate with the brain via our natural sense organs. Reanimation of cryogenically-suspended patients. Persons frozen with today’s procedure can probably not be brought back to life with anything less than mature nanotechnology. Even if we could be absolutely sure that mature nanotechnology will one day be developed, there would still be no guarantee that the cryonics customer’s gamble would succeed – perhaps the beings of the future won’t be interested in reanimating present-day humans. Still, even a 5% or 10% chance of success could make an Alcor contract a rational option for people who can afford it and who place a great value on their continued personal existence. If reanimated, they might look forward to aeons of subjective life time under conditions of their own choosing. A rather LOOOONG list of expectations, ideals, and not to forget to mention, SALEMANSHIP of the idea on “how the world can become a better place for everyone”, all on the basis that “technology will save the human race”. – REALLY ?!?!?!? I always thought it was OUR personal and voluntarily-collective responsibility to preserve and improve our world, by “Being the Best Humans we can be”?!? – This is not a responsibility to be take lightly, and not one to be given up for someone else to do FOR us! I will deal with more of the “buzzwords” and “selling points”, and what they really mean for us all. This will be the post to dissect the very point being made by this movement. Temple of The Ancient Dragons My prime website for all things dragons and spirituality. The Home of Dragon's Eye My new personal homepage. My LinkedIn Profile My Profile on LinkedIn. My Scribd My Scribd.com account where I upload and publish some of my works. I Summon Thee, Leviathan, Your Cleansing Tides. Get US Out of the UN! Classy Low-Riders, Mini-Trucks, and other Great Wheels, Illustrated. 'Traditional Healing for Pets and People' - Shamanic Healing - Reiki - Hypnotherapy - Regression -E.F.T. - Munay Ki - Herbalist - Workshops - Bespoke Gifts. promoting responsibility and integrity within the pagan community, through knowledge and awareness.